There is an undeniable richness in the choral music of Latvia. A sense of mystery pervades the vertical chords and lyrical lines; listeners find themselves drawn to the sounds and spirits of the composers that emerge out of that part of the world. In many nations, a formal musical education fails to study, or even mention, the rich music traditions of Latvia and the other Baltic countries. Few of today’s mature conductors heard much about Latvian choral music in their formative years. All of that began to change in the early 1990s, when the dawn of the internet age united with Latvia’s independence in 1991. The unique Latvian culture began to emerge into the mainstream of the world’s artistic consciousness. The musicians of Latvia have done an excellent job in gathering their resources and making them available to the rest of the world. Publisher Musica Baltica does a tremendous job in delivering scores and recordings. Another outstanding business, The Latvian Publishing company, teamed up with Ave Sol, a professional Latvian choir, to produce the distinguished Anthology of Latvian Choral Music, a resource that belongs on every conductor’s shelf. Professional Baltic choirs share much of this unique music with superb interpretations that are delivered on remarkable recordings. One of the outstanding cultural events in Latvia is the Latvian Song and Dance Festival. It is a renowned event, featuring 40,000 singers performing folksongs and classical works. The massive gathering takes place in the capital city of Riga every five years, a city that will become the European Capital of Culture and also host the World Choir Games in 2014. This article is a precursor to the 2014 international focus on Latvia. It brings attention to three prominent composers: Pēteris Vasks, Uģis Prauliņš, and Ēriks Ešenvalds. 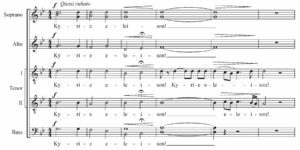 Each of the composers has a full catalog of choral music that varies in difficulty. This article focuses on some of their most accessible unaccompanied music. Most people today no longer possess beliefs, love and ideals. The spiritual dimension has been lost. My intention is to provide food for the soul and this is what I preach in my works. 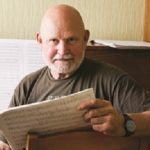 Pēteris Vasks, the son of a Baptist pastor, is one of the most important living Latvian composers and his sustained career has had a huge impact on other Baltic composers. His works encompass nearly every genre, including orchestra, keyboard, and chamber music. 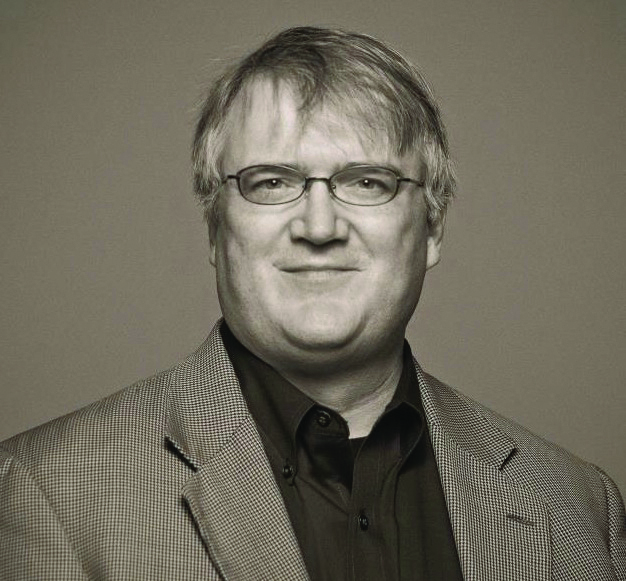 His music makes frequent appearances in performances by elite choral ensembles around the world and his work is often the subject of scholarly inquiry. Māte Saule was an early work of Vasks and one that the composer describes as “close to his heart.” It is also a work that contains some of his very early musical strategies that he develops over his compositional career. The work sets a text by Jānis Peters that evokes thoughts about the mystery of morning and the glory of the sunrise. Marked misteriosamente, it opens with an undulating two-note figure rendered in an aleatoric fashion. When performed by several singers, the resulting sound has an enigmatic characteristic; it brims with potential. In Figure 1, the rippling motive sets up a feeling of restlessness and sets up the first entrance of the text. Vasks’ undulating motives appear throughout the work. At times, the motive serves as an accompaniment to other musical ideas, like in the opening measures. At other times, the aleatoric elements are paired with precise rhythmic entrances, a technique that gives Vasks’ music a unique flavor. The motives occasionally appear to be a point of dramatic destination, shown in Figure 2. These two musical examples (Fig. 1 and 2) also demonstrate Vasks’ use of motivic repetition, a device that adds cohesiveness to the work and builds interest into the music. The stacking of musical motives in stretto fashion is a common compositional technique; Vasks’ providing an aleatoric destination for these motives is uncommon. The result is a remarkable sonic high point to the piece, one that falls off into a pedal point drone in m. 36 (Figure 3). This work begins to close with a homophonic hymn-like few measures of unresolved dissonances and unique voicing of parts. (Figure 4) At the end of the work, Vasks paints a glorious picture of a musical sunrise of fifteen successive notes that ends with the loudest sound possible (ffff). One can explore similar musical techniques in Vasks’ Madrigals (1976), Zemgale (1989), and Three Poems by Dzesław (1994). “Music and love explain everything. Those must be searched for and shined at all times, since no truth is permanent. Everything is allowed, and nothing can be made an absolute – since nothing is certain, except for love. 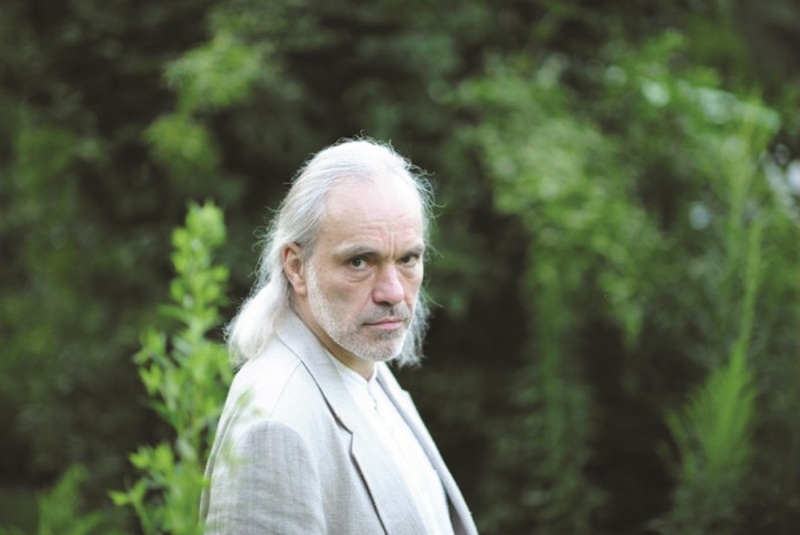 Uģis Prauliņš brings a diverse background of skills and former positions to his capacity as a composer. 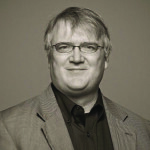 His training includes formal studies at the Emīls Dārzins Music School and composition study with Jānis Ivanovs in the early 1980s, but he also brings skills he gained from his work as a professional sound engineer at Latvian Radio and as a professional musician in the 1970’s and 80’s as a keyboardist with progressive rock and folk bands. Prauliņš work as a composer of choral music recently made a splash on the world of classical music when The Nightingale, performed by Stephen Layton and the Danish National Vocal Ensemble, was nominated for a 2013 Grammy award for ‘Best Choral Performance’. 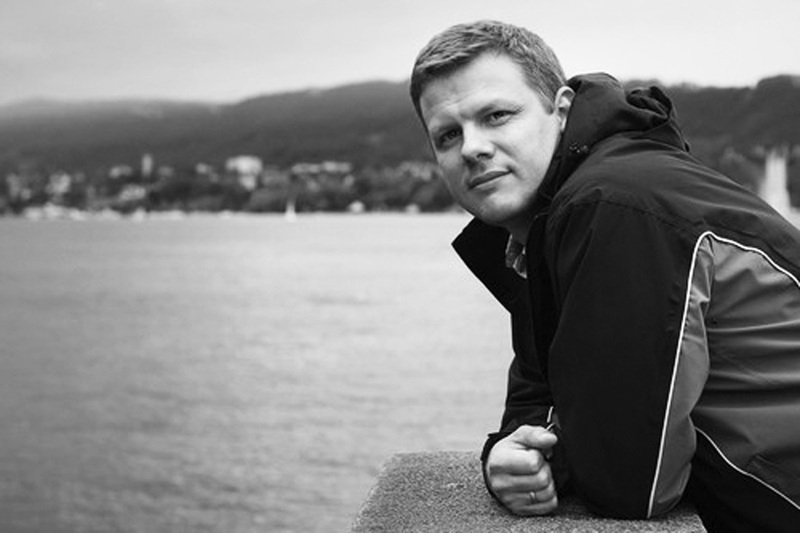 Layton had worked with Prauliņš music before in a Hyperion recording of Missa Rigensis, a compelling work that was originally composed for the Riga Dom Boys’ Choir; the work was premiered in Easter of 2002 at the Riga medieval cathedral. In Missa Rigensis, Prauliņš sought to compose a work that evoked Masses from the Renaissance in the style of composers that guided him in his school years, including Marenzio, Praetorius, and Orlando di Lasso, to name a few. The work is also meant to be a ‘rocky choral monument’ to his native city, Riga. With Prauliņš, what seems at first to be a traditional beginning ends with innovation. His fusion of the ancient and modern makes Missa Rigensis a captivating work that engages the audience from the very first phrase, shown in Figure 5. 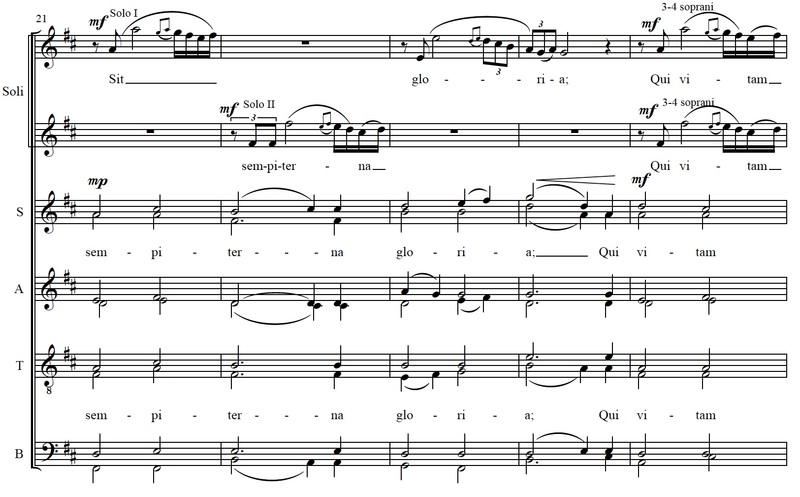 At first glance, the music looks like a conventional setting of the Kyrie text. Closer inspection reveals interesting performance instructions (m. 3), unanticipated dissonances (m. 4), and a phrase that ends on a perfect fourth (m. 60), evoking a mysterious feeling, aided by staggered cut-offs of the upper and lower voices in the final two measures. Figure 5, Prauliņš, Kyrie from Missa Rigensis, m.1-6. 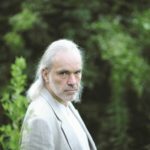 Prauliņš has the ability to infuse the traditional Kyrie text with a spirit of plaintive longing by borrowing modern harmonies and ancient resolutions. The third statement of the Kyrie, shown in Figure 6 demonstrates this with close dissonant harmonies in each of the measures, followed once again by staggered cut-offs and perfect fourth. The entire Missa Rigensis is a fascinating composition; other movements hold an equivalent amount of mystery, beauty, and creativity. Many of the movements can be extracted and performed as single works, but the work is brilliantly conceived and stands as a unified whole. The Missa Rigensis is available from Novello; there is an excellent recording of the work by Stephen Layton and the Choir of Trinity College, Cambridge on ‘Baltic Exchange’. This Hyperion produced recording also features Prauliņš’ Laudibus in Sanctis, another outstanding work for choir. Ēriks Ešenvalds is one of the best known Latvian composers today, especially in choral music. A father of three children, Ešenvalds has most recently served in the position of Fellow Commoner in Creative Arts at Trinity College at the University of Cambridge, UK. 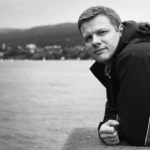 His experience as a singer with the professional State Choir Latvia gives him an intimate look at the inner workings of great choral music as well as a passion for recreating it. Works most suitable for professional choirs, such as Sun Dogs, Legend of the Walled-in Woman, and Seneca’s Zodiac. Songs for children’s choirs, like The Beginning Emptiness and Spring, the Sweet Spring. 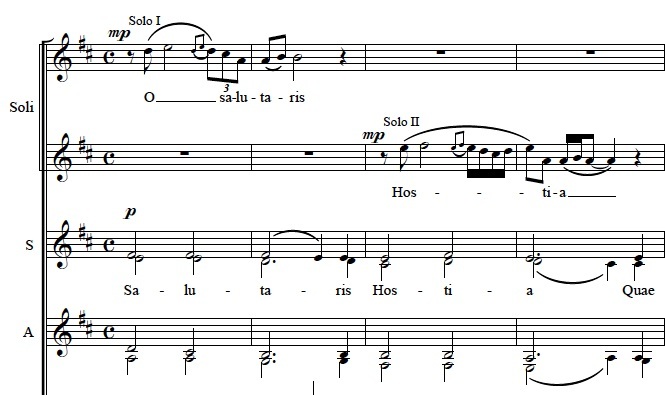 Ešenvalds’ O Salutaris Hostia belongs in the category of works suitable for the best University choirs. 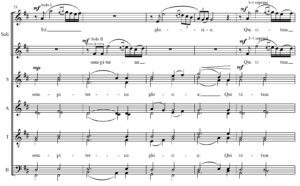 It is a relatively short and accessible piece that possesses a simple beauty, much like Kodaly’s miniature Esti dal. 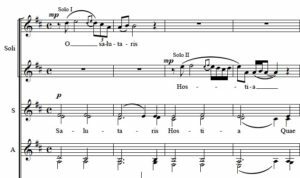 The chorus part is nearly all half notes, and it provides lush harmonies that support the soaring lines of the two sopranos. At the loudest moments, the composer adds additional singers to the solo lines in an effort to strengthen the melody, shown in Figure 8. 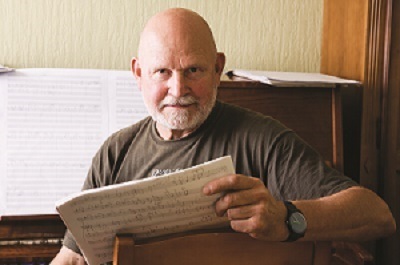 Ešenvalds’ publisher, Musica Baltica, is supporting the popularity of the composer with the publishing of two collections of his music, Choral Anthology 1 and 2. Together, they bundle eleven works popular works of the composer, including O Salutaris Hostia, A Drop in the Ocean, Amazing Grace, and Long Road.